By TEMV member Linda Gilmore. In 1942, the curators of the small Jewish Museum of Prague were concerned about the synagogues and ritual items in the towns of Bohemia and Moravia whose Jewish populations had been sent to Terezin and other concentration camps. They convinced the Nazis to allow the collection and transport of ritual items from these communities to Prague so they could be preserved. During this time the inventory of the Jewish Museum of Prague swelled from under 800 items to over 100,000 items which included books, candle sticks, breast plates, crowns, Torah ties, Torah mantles, and about 1,800 Torah Scrolls. Under the watchful eye of the Nazis, the curators sorted, classified and catalogued the items before they were also sent to the death camps. There has been a legend that this accumulation of Judaica was planned by the Nazis to be their museum to the extinct Jewish race, but it was the idea of this small group Czech Jews who wanted to save their heritage and allow the returning survivors to reclaim their Torah Scrolls and other ritual items. At the end of the war only about 50 congregations were re-established. They were provided with needed religious items but not necessarily from their communities. However, the Communist coup in 1948 stifled Jewish revival and most of the congregations closed and their artifacts were returned to the museum. Following the war, the Jewish Museum became the State Jewish Museum in Prague and was under the control of the Czechoslovak government. Between 1956 and 1959, the Torah Scrolls were transferred to the Michle Synagogue in a suburb of Prague where they were stored on crude wooden racks reaching from the floor to the ceiling. 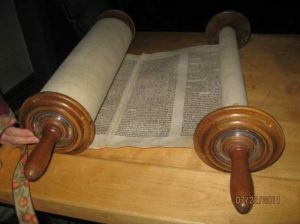 The staff of the museum could not provide the Torah scrolls with the care they needed for preservation which includes rolling each parchment scroll from one end to the other two or three times a year. In 1963, on a visit to Prague, an American art collector named Eric Estorick was told about a huge collection of Judaica at the Michle Synagogue and was asked if there was anyone interested in a large number of Czech Torah Scrolls. Estorick contacted Chimen Abramsky, an authority on Judaica in London, to examine some of the scrolls and determine their authenticity. He also contacted one of his clients, Ralph Yablon, a member of London’s Westminster Synagogue who then contacted his Rabbi, Harold Reinhart. Rabbi Reinhart, the Chief Rabbi of Westminster Synagogue and originally from the USA, had been considering starting a Holocaust memorial museum at his synagogue. Rabbi Reinhart thought that some of the Czech Torah scrolls could be used to begin this project. Yablon purchased 1,564 of the scrolls from the Czechoslovakian government and also provided funds to have them packed and shipped from Prague to London. Rabbi Reinhart and the Westminster Synagogue organized a committee, Memorial Scrolls Committee, to prepare for the Torahs. On February 5, 1964 the first truck carrying the Torahs arrived. They were numbered and placed on special racks. The process of sorting, registering, and providing day-to-day care of the scrolls became a community wide project that involved the help of the entire Jewish community in London. The purpose of the committee, now the Memorial Scrolls Trust, has been and continues to be the restoration and distribution of the Scrolls across the world. They are a religious and educational symbol of Jewish survival, continuity and rebirth. As of today, about 1,400 of these Torah Scrolls have been loaned out to Jewish congregations and both Jewish and non-Jewish communities and organizations all over the world including one at the White House. Let me assure you that Temple Emanuel of Lowell will feel proud to receive this Scroll into its keeping and will cherish the hope that its presence will inspire our members and their children to live in keeping with the spirit of the now destroyed community which formerly owned it. Unfortunately, over the years, the story of this Torah was lost. On contacting the Memorial Scrolls Trust, our Torah was originally identified as an “orphan” Torah. This meant that the identification tag was lost and they did not know what community had previously used our Torah. In order to find a community to adopt it, the Trust did some research to try to find the town our Torah came from. However, more recently, they have done additional research and have found our Torah was sent to Prague from Sobeslav. This was the last known home of MST #244 before being received by Temple Emanuel, and is the name on our certificate. It is one of 12 Scrolls recorded to have come from Sobeslav. 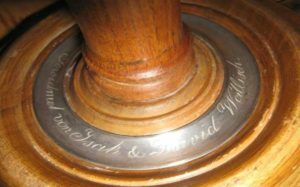 On contacting the Jewish Museum in Prague, it was learned that they still had a Torah mantle in their collection that was also attributed to Isaac and David Wallisch. The mantle was collected from the community of Police/Pullitz which had been incorporated into the neighboring community of Jemnice in 1890. However the mantle has several lines of Yiddish/Hebrew that translate “David Wallisch, head of community, and his brotherin-law, Itzak Wallisch, warden of the alms box, with wives here in Safov community, in the year 1884.” It is obvious that the mantle started out in Schaffa/Safov. It will probably never be known when the mantle was separated from the Torah and sent to Police but it is clear that its town of origin was Schaffa/Safov. Schaffa, in 1938, had about 25 households with a total of 52 Jews. After Kristallnacht, about a third of these emigrated abroad and the rest were deported in 1939. Znaim was a much larger community. During Kristallnacht the synagogue was set afire and later torn down. It is thought that there were over 600 members of the Znaim community who died after being deported. Jemnice had about 52 Jews living in the community in 1930. In 1942 everyone was deported and killed and the synagogue and cemetery were both destroyed. Sobeslav had a Jewish population of about 78 in 1930. They were deported to Theresienstadt/Terezin Ghetto and from there to Auschwitz in September and October, 1943. There are no Jews living in these communities today.